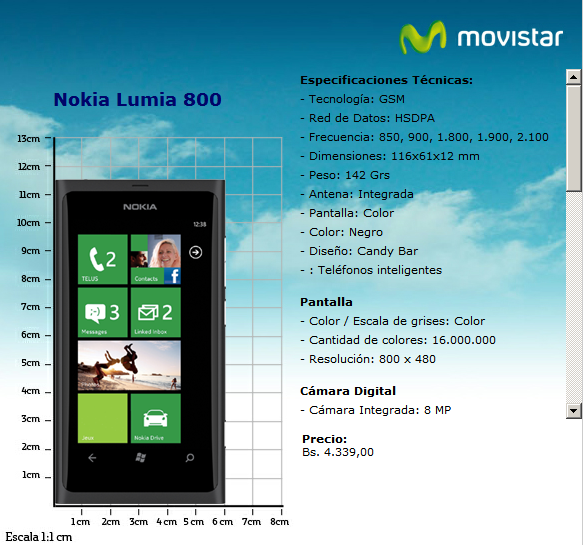 The Nokia Lumia 800 Windows Phone is now available in Venezuela through operator Movistar. The device is selling at a price of Bs. 4.339,00 and is available for purchase through the Movistar website. The product page for the Lumia 800 available through Movistar only includes information, in the form of a pop up, therefore you have to navigate elsewhere around the website to make your purchase. The Lumia 800 in Venezuela supports HSDPA, GSM, and only available in the black version at the moment. It features a 800 x 480 3.7″ Display, 1.4 GHz processor, 8MP rear camera with 720p video recording, and 16 GB of internal storage. Let us know if you live in Venezuela and purchase one! Yesterday i realized that they have it on Sambil Mall. The phone is not heavy, the metallic look fits any hand, speed and responsivness is very nice. I like it the phone, since the price does not meet my budget at this time. I will be waiting for a price decrease and maybe will try Windows Phone. Regards!